Although SDSM&T offers no degrees in the humanities and social sciences, our HU/SS courses will complement your technical study and enrich your academic and intellectual life. Professors Rice and Sneller; Associate Professors Adkins, Hudgens, and Mitchell; Assistant Professors Armstrong, Bumbach, Haugtvedt, Kremmel, and Tidwell; Professor Emerita Antonen, Palmer, and Shirley. The Department of Humanities provides study in the fields of art, communication, foreign languages, humanities, literature, music, philosophy, and western civilization. The curriculum uses a broad-based approach, often developing linkages between the humanities and the technological fields that our School of Mines students enter after graduation. 1 Does not meet general requirements for graduation. 2 Meets general requirements for graduation, but not for humanities credits. 3 May not be used as humanities credit, but may be used for free elective credit. Consult advisor for further details. 4 May not be used as humanities credit, but may be used for PE or free elective credit. Consult advisor for further details. 5 May not be used for credit. 6 May be used for humanities credit but does not count as general education credit. 7 Students must complete three (3) semesters/ three (3) credits in MUS 117 to earn goal 4 general education credit in Humanities. Ensembles - Wind Ensemble, Concert Choir, Jazz Ensemble, Master Chorale, Brass Choir, University Band, University Orchestra, University Choir, and other instrumental and vocal ensembles. Performance Opportunities through university concerts, participation in events such as the South Dakota Intercollegiate Band and the National Association of Teachers of Singing competitions, and campus events such as the Parents Day Talent Show. 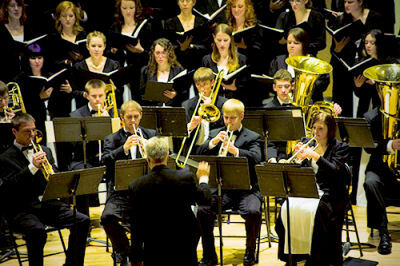 Concerts and recitals are presented throughout the year both on campus in the Music Center and at venues around Rapid City and the Black Hills. Appearances are made throughout South Dakota and neighboring states at music association conventions, alumni gatherings, festivals, and competitions. Music ensembles have traveled to major national and international music events resulting in critical acclaim and recognition through first-place awards such as the New Years Eve Mass in Vienna’s Karlskirche (1990), Lindenholzhausen Harmonie-Festival (1993), Florence’s Palazzo Vecchio (1996), Circolo Artistico in Venice (2001), the Association of Irish Musical Societies Choral Festival (2006), and the Konstanz (Germany) Münster (1993, 1996, 2003, 2010, 2016). The Apex Gallery was established in 1989 and is housed in the Classroom Building. Open during the academic year, it offers educational and science exhibitions for the enjoyment and enrichment of people of all ages. The gallery features contemporary works of artists and scientists, many of whom are nationally and internationally recognized. These exhibits are designed to reflect a cross section of cultural expressions and perspectives. Professors Gilmore and Van Nuys; Associate Professor Dreyer; Assistant Professors Gibson and Pritchard; Devereaux Library Director Andersen; Associate Librarian Collection Development Davies; Professor Emeritus Goss; and Associate Professor Emeritus McReynolds. The Department of Social Sciences provides courses in the branch of study that focuses on the institutions and functioning of people in society. By utilizing empirical and quantitative methods in the study of human beings, the curriculum often reflects the technical and scientific nature and mission of the university. 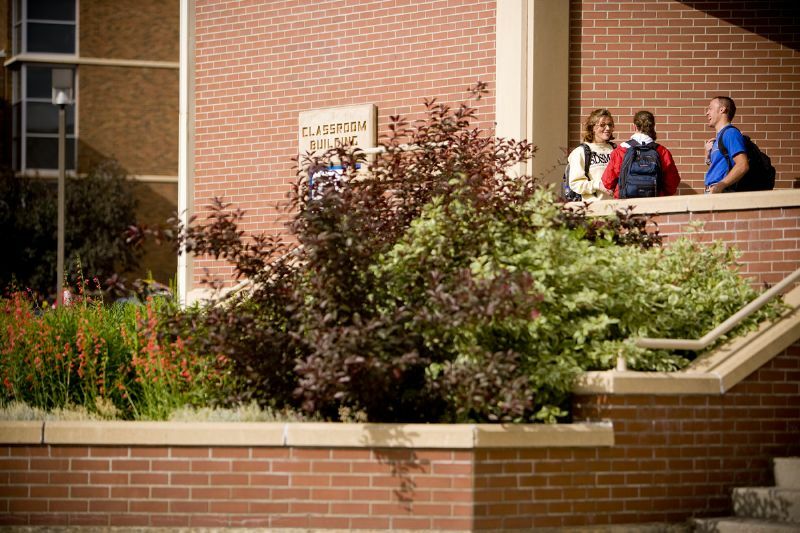 Business courses are available from Black Hills State University. ECON 201 or ECON 202 may be used toward fulfillment of the general education requirements in Social Sciences. BADM 350 and BADM 360 may be used as upper division Social Science courses. All other BADM and ACCT courses are counted toward graduation as electives only. Interdisciplinary Sciences: Atmospheric Sciences Specialization, B.S. Interdisciplinary Sciences: Pre-Professional Health Sciences Specialization, B.S. Interdisciplinary Sciences: Science, Technology, and Society Specialization, B.S.